When Oleg Deripaska and the Rusal group of companies attack one of their most senior executives for a nine-year old crime that wasn’t, the question that arises is: what does the target know about Deripaska and his methods that may be so dangerous, his credibility and his livelihood should be destroyed? Why resort to lying in the courts of New York and Cyprus, despatch false claims to international banks, and leak fabricated allegations to the Russian press, unless Deripaska is personally threatened by the possibility that old friends are ready to spill the beans on him? Why is Deripaska so afraid of Andrei Raikov that Rusal is claiming he is on an international wanted list, when Interpol says he isn’t? Raikov is one of the veterans of the Russian aluminium business, and has been well known to the international trade for almost twenty years. In the late 1990s, when Deripaska was trying to set up procurement and trading schemes independent of those he had been managing for Mikhail Chernoy (Michael Cherney), Raikov was put in charge of supplying bauxite from mines in the West African Republic of Guinea. These supplied the raw material to the Nikolaev alumina refinery in Ukraine, and had been doing so since the 1970s when the mining, supply chain, and refining were first set up during the Soviet era. Raikov first appears in the records of Siberian Aluminium (Sibal), the first of the metal holdings Deripaska claimed to be his own, when sources remember Raikov was closer to the chief executive, Alexander Bulygin, than he was to Deripaska. Bulygin went into hiding after breaking with Deripaska at the end of 2008, when Rusal was on the brink of bankruptcy. Bulygin refused to testify in the UK High Court action late last year, when Roman Abramovich was defending himself and Deripaska on the charge of having stolen Rusal from some of its original shareholders. In 2001, Raikov was president of the Rusal subsidiary in Guinea, when it took over the Kindia bauxite mining concession. Rusal then went on to take the Friguia bauxite and alumina concession in the same country, as well as the undeveloped Dian-Dian bauxite deposit. For the past two years the Guinean Government has been suing Rusal for corruption in these deals and related ones in Guinea; as well as for under-payment for the concession rights, violation of concession production and ecological obligations, and avoidance of taxes and customs duties. Raikov originally worked in Guinea with a Lebanese, Armenian and Iranian, the last of whom was the brother-in-law of Simon Reuben, a London trader whom Deripaska was also attempting at the time to drive out of the business; ultimately Deripaska had to pay Reuben $300 million by court order. 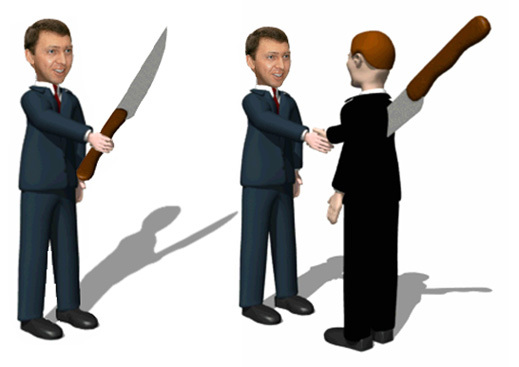 Deripaska rewarded Raikov for his loyalty by promoting him to manage all of Rusal’s worldwide supply requirements for its metal smelters – bauxite, alumina, cathodes. But then, according to an internal source, Raikov was sidelined from the business he knew best, and made chief executive of one of Deripaska’s oil businesses, United Oil Group, at the time Deripaska was making his abortive effort to take over Mikhail Gutseriyev’s Russneft. The last Raikov is heard of in releases from Deripaska’s Basic Element was in September 2008. According to the allegations Deripaska is now airing in the courts of New York and Cyprus, Raikov, another Russian named Dmitry Osipov, and several shipping companies associated with them were involved in transportation of bauxite or alumina cargoes for Rusal from Guinea, Australia, Guyana and other places. The shipments started in July 2003 and ended in November 2007. A commercial dispute was then raised by Rusal, claiming that Osipov and the Cyprus-registered shipping companies they controlled had over-charged Rusal and its subsidiaries by excessive charter and cargo rates. This dispute was settled on November 2, 2007, in an agreement signed for Rusal by Pavel Ovchinnikov. This Ovchinnikov, who was also involved in the chartering and shipping arrangements, was subsequently promoted into Raikov’s job, and then into the post of commercial director for the entire group. A few weeks ago, according to Rusal claims, Ovchinnikov was moved from Rusal to Deripaska’s holding, Basic Element. The website of the holding has yet to record his new job and title. Ovchinnikov’s signature in 2007 meant that five years ago Rusal was releasing Osipov and the shipping companies “in respect of all claims including fraud” for vessel contracts commencing nine years ago. Why then has Deripaska restarted the claims, and published them against Raikov without revealing all that had gone before? According to a Kommersant report, appearing on April 19, Rusal is now accusing Raikov of receiving kickbacks from the over-charges and shipping charters. Rusal, through a Jersey (UK)-registered front company called RTI Limited, has applied to the federal district court in New York, according to the Kommersant allegations, to order disclosure of banking details of US accounts held by Raikov or the shipping companies involved in the earlier shipments. The disclosures are purportedly sought in support of a civil lawsuit in the Cyprus courts and a criminal case in Russia. It is now alleged that Raikov and the others have caused Rusal an estimated $3.4 million in losses between 2003 and 2006. Raikov, Kommersant claims, was arrested in Moscow in July of 2011 on the Rusal allegations, then released on his own recognizance. He has subsequently disappeared through Minsk, the newspaper reported. In addition to the old shipping claims, Rusal had added a fresh one relating to allegedly fraudulent transactions Raikov authorized when he was running Deripaska’s little oil company. Kommersant also reported a lawyer acting for Raikov and an anonymous friend as saying the charges were a frame-up by Deripaska. “The case,” said the friend, “is a personal conflict of Andrei Raikov and Oleg Deripaska, who had been friends and worked together since 1995.” What exactly Deripaska and Raikov have fallen out over remains for Raikov to reveal. The Kommersant report was republished on the same day by RAPSI, a Moscow agency for legal news. Both reports claim that since last year Raikov has been placed on the international wanted list. According to Interpol, there is no such listing. The Russian press reports didn’t quote from the court files in New York and Cyprus. Those files, including an appeal motion filed in New York last Friday, June 22, reveal that the US court proceeding is legally flawed because the Rusal company pursuing the bank disclosures doesn’t have legal standing in the US; because the claim that the information is required for a criminal proceeding in Russia appears to be false; and because the Cyprus court proceeding has uncovered evidence of lying and deceit by Rusal lawyers in hot pursuit of Raikov. According to the appeal motion and other documents in the court file, an investigation of the kickback allegations had been made in Moscow at Rusal’s request in 2007-2008. At the time, Rusal alleged that its losses from the over-charging, kickbacks and other fraud had amounted to $50 million, according to the police record. The Russian investigators report that they had warned Rusal against perjury, and concluded there was no evidence of the crimes Rusal was alleging. This report was dated April 4, 2008, and signed by four officers. It was approved by their commanding officer, Colonel R.Z. Verizov, on May 4, 2008. The Cyprus court documents reveal another form of deceit by Rusal. In May of 2011, several Rusal companies launched a new claim in the District Court of Nicosia, this time alleging that as part of the old charter rates dispute ended by Ovchinnikov in 2007, Raikov had been paid kickbacks. There has been no trial on these allegations yet. But Rusal also applied to the Cypriot judge to order Hellenic Bank, a local bank, to disclose financial account data from Raikov’s accounts; freeze his access to his money; and keep secret that the application had been made against him. The judge refused to agree. “The Cyprus court issued an order prohibiting Hellenic Bank from informing Raikov and the Cyprus Defendants [Osipov’s shipping companies] but did not issue orders as to the other relief requested.” Knowing they were barred, Rusal’s lawyers then told Hellenic Bank to hand over the personal account information. This was done, according to the court submission, with “improperly included language which made it appear as though Hellenic Bank was required to disclose banking of Raikov.” Rusal, the submission says, had acted illegally. So had the bank. In the US court last week, it was argued that this form of deception was being attempted again, this time in order to procure a US court order for disclosure of account details by JPMorgan Chase, Citibank, Deutsche Bank, and Bank of New York Mellon in support of the Cyprus case. This is illegal, the defence lawyers contend, because the Cyprus court has already rejected the application for disclosure against Hellenic Bank, and because Hellenic Bank had acted improperly.